A mushroom is the reproductive structure, or ‘fruit’ of certain fungi, like the apple on a tree- the fungi itself is like the whole tree with the roots and leaves and all. Like the apple, mushrooms are only produced every once in while, when the organism needs to reproduce- spread spores, the mushroom’s equivalent to seeds. Is it a type of plant? Is it a type of bacteria? Is it a type of animal, like us? No. Fungi is its own kingdom of life, neither plant nor animal, which contains many different fungi including molds, yeasts and different types of mushrooms. But, crazily enough, humans are more closely related to fungi than to any other kingdom of life. Only 600 million years ago (no big deal), animals and fungi shared common ancestry. That’s when a few single celled organisms developed into multi-celled creatures. Some became animals, some became plants and others became fungi. 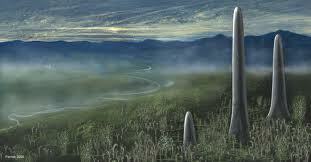 This is an artist’s depiction of a giant fungus 420 million years old. This was the tallest organism on earth at the time, and was more than 20 feet tall! This is a silly timeline I made for a kids workshop to show the history-story of fungi on earth. 250 million years ago, a catastrophe wiped out 90% (most) of earth’s creatures when, according to some scientists, a meteorite struck. Tidal waves, hot gases and winds of more than 1000 miles per hour scourged the planet. The earth was dark beneath a giant dust cloud, causing massive extinctions of plants and animals. Fungi inherited the earth when all these other life forms died. They did so well because they are the earths grand recyclers- recycling all the debris from the catastrophe. They break down carbon (an element, large organic molecules and the basis for most life) for food into simpler forms, and in doing so nourish the soil and other life. Because of this, they are the interface between life and death. Anyways- Then, the era of the dinosaurs began- and ended- 185 million years later when another meteorite hit, causing another massive extinction. Again, fungi thrived and many partnered with plants for survival. Humans have used mushrooms for food, medicine and many other things for a very long time. 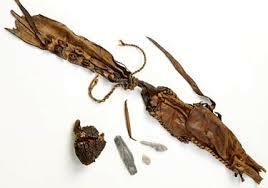 The oldest intact human ever found, called Otzi or the Iceman, was found mummified in a glacier in Italy. He lived 5300 years ago. In his pouch, he had a type of fungi called the Tinder Polypore, which has been used by humans to start fires and carry embers long distances, as well as for medicine against cancers and bladder disorders, and for rituals. The Egyptian pharaohs reserved mushrooms for their own plates (3000 BC). It was forbidden for anyone else to eat them, because they believed the mushrooms had magical powers. The ancient Romans (100-200 AD) fed mushrooms only to their warriors because they believed mushrooms gave them god-like strength. Mushrooms have also been used to create dyes and paper, for sharpening tools, and for orientation. The Japanese use mushroom juice to combat wrinkles, the Haida rubbed Puffball spores on newborns to prevent bedwetting. Mushrooms have been an important part of many religious and spiritual practices of many cultures. Today people all over the world use mushrooms for food and medicine. More and more research is finding the amazing medicinal powers of many mushrooms to prevent and treat cancer. As well, mushrooms help us stay healthy because they are incredibly nutritious and tend to have anti-viral and immune boosting properties. Even insects farm mushrooms for food and medicine! Termites cultivate mycelium to feed their larvae; ants (including leaf cutter ants) grow a type of mycelium which produces a natural antibiotic against their parasites and predators, as well as feed it to their larvae. We live in a time with lots of challenges to our health from pollution and disease, because the earth and ecosystems which support us are polluted, damaged and changing. Fungi are great healers for our bodies and environment. They are natural antibiotics, and help fight cancer and other illnesses which come from living in a polluted environment and eating unhealthy food- they have also been shown to help heal and regenerate damaged or polluted environmental systems. For example, they can break down toxic wastes and like oil in oil spills. What are fungi and where do they live? Fungi are woven in a living network across the land beneath our feet. Mushrooms are just the reproductive part, the fruit of the fungi, the part that sticks above the surface. They are only a small part of the fungi. The rest, the part that takes in food, grows below the surface of the ground or inside trees and other things. This hidden part is called mycelium. It is a web of white threadlike structures called hyphae- the hyphae are the individual strands, the mycelium is the web of interconnected hyphae. This mycelium acts like the stems, roots and leaves of plants because it takes in all the food the fungi needs to grow. So fungi is really this web of threadlike cells called mycelium, plus the mushrooms you see. Some mycelial networks can be thousands of acres in size, and thousands of years old, and weighing hundreds of tons! The largest mycelia network is in Oregon and is 2400 acres large and 2200 years old! You can see mycelium, web of white threads, running along most logs that you turn over in a forest. Fungi are like humans, in that they breathe oxygen and expel carbon dioxide. We also both eat food. But a little bit differently: Fungi digest food outside themselves by secreting acids and enzymes into their environment- then absorbing nutrients using net-like chains. So basically, fungi digest their food outside of themselves and then ingest it- bring the nutrients into themselves. Humans bring our food (ingest) into our bodies and then digest it. Put another way, humans live inside houses and eat sandwiches. For fungi, their sandwich is their house. What exactly fungi eat depends on which type it is! There are 4 main groups (outside of yeasts and molds) but these aren’t super strict categories because many fungi jump between them at different times or blur the lines. One really cool group are the Mycorhizal fungi. Myco means mushroom, rhizal means related to roots, so mycorhizal fungi are those that form symbiotic relationships with plants where both the fungi and plant benefit. In fact most plants have mycorhizal partners, from Douglas fir trees to grasses. Mycorhizal fungi mycelium connect with plant roots and extend way beyond (10-100x), because of that they are able to bring nutrients and water from well beyond what the roots could reach on their own. Plants with mycorhizal fungi partners grow way better, and can resist disease better than those without. Fungi benefit because they eat some sugars from the plant. Chanterelle mushrooms are mycorhizal. 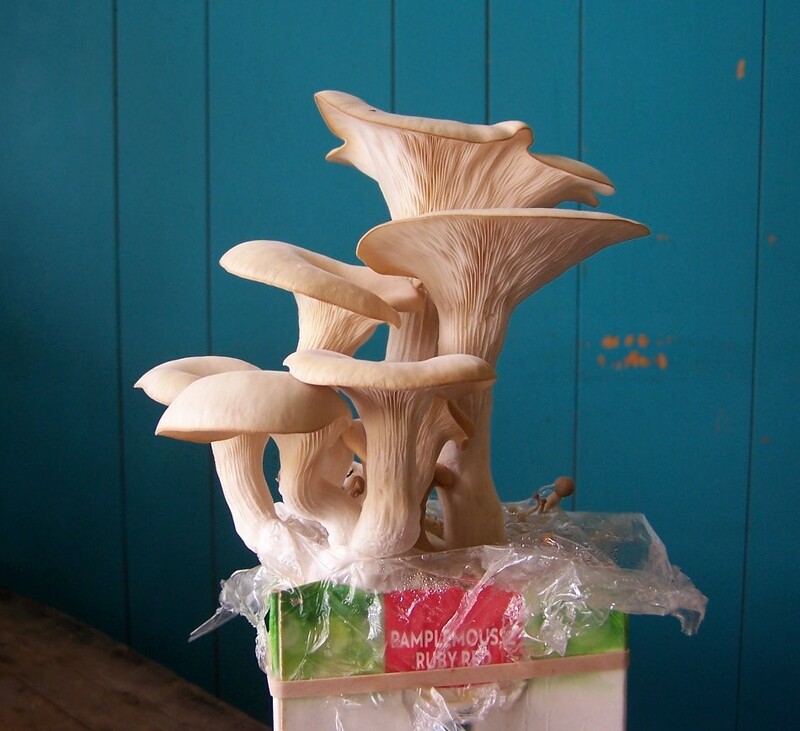 It is very difficult or even impossible to grow our own mychorizal mushrooms, because they mainly exist in a mycelia state underground in association with plant roots. 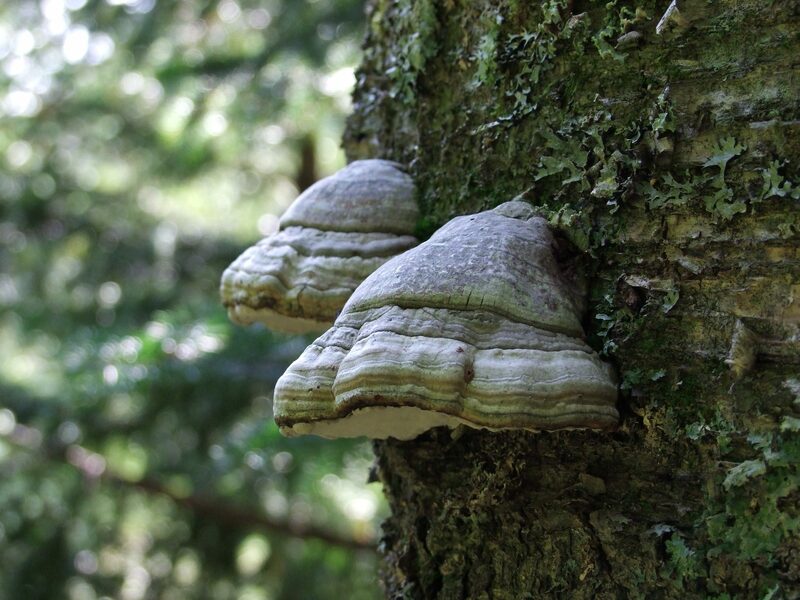 When old growth forests are cut down, fungi loose their foothold in the ecosystem. Less than 5% of the old growth forest in the Pacific NW survives today, and more is being cut down all the time. The second group of fungi are called endophytes, a type of fungi that isn’t mycorhizal but partners with many plants. One example is a small cuplike mushroom that lives on alder trees. Endophytic mushrooms are really good at producing toxins which help defend trees and plants from disease and insect attack. There is one type of endophytic fungi which has a partnership with wheat, promoting growth, increasing leaf and seed production, and protects from infection. The third group are those which feed on living organisms, usually trees and are considered ‘parasitic’. They can destroy thousands of acres of forest, or just infect trees with cankers and lesions. However, many people are coming to recognize the importance of so-called parasitic fungi. They may be natures way of repairing damaged ecosystems and increasing biodiversity. Each time a fungal blight sweeps through a forest, nurse logs are created which support lots of new life, healthy soil is created, and ever-richer habitats are made where only barren rock once stood. They often only appear when a forest is out of balance and unhealthy- because of acid rain, groundwater pollution and insect damage. Now we move on to our favorite, the saprophytic fungi who recycle the organic matter of the world. These are the mushrooms we tend to eat, and the ones we can grow. Saprophytic is a general term used to describe any fungus that plays a role in the decomposition process of matter; thus they are also known as the decomposing fungi. Saprophytic fungi turn dead wood into soil. If there were none of these fungi, the earth would be piled high with dead trees, just lying on top of one another! Year-round, these fungi decompose and recycle plant debris, and in doing so restore and create soil, which allows plants and animals to flourish. They are vital to the health of forests. Primary Decomposers, who are fast growing , and the first to grow on a twig, blade of grass, chip of wood, log, stump or dead insect or animal. Oyster mushrooms, Shiitake, Portebello and Reishi mushrooms are primary decomposers. Secondary Decomposers– work together with many bacteria and other fungi in the soil and in compost piles to continue to break down organic matter that has already been partially broken down by primary decomposers. The white button mushroom you see in the grocery store is a secondary decomposer. Tertiary Decomposers– are fungi found towards the end of the decomposition process, including honey mushrooms. Do you know how mushrooms grow? Fungi reproduce not from a seed or an egg, but from a spore. Spores are so tiny that you can’t see them without a microscope. Millions of spores together would look like fine powder. They grow on the mushroom itself when it appears above ground. When they are mature, spores shoot out of the mushroom at speeds of 25,000 G-force, and can drift away on the wind or get carried by animals, humans, flies. A single mushroom may release billions of spores a day, but only a tiny percentage of them will land in an environment suitable for germination and growth. What kind of environment do you think spores need to grow? If they land in a dark, damp place with a food source, they will grow. First, they develop a threadlike structure called a hyphae. These hyphae grow and branch in all directions to find a mate, another spore who has turned into hyphae. Once found, they physically combine and grow as one, branching out even more in search of nutrients and water. This web-like structure is now called mycelium. This part of the mushroom, the mycelium, acts like the stems, roots and leaves of plants because they take in the food- organic matter- to make the mushroom grow. This is all happening underground where we can’t see it. After the mycelium has grown to a certain point, and when the environmental conditions are right the part of the mushroom that you see above the surface develops. This part is called the fruiting body. When it first appears it looks like a little button. This button-like part of the fruiting body is called the cap. The cap is protected by a thin covering called a veil. As the mushroom grows bigger, the veil splits and falls down around the stalk (stem) of the mushroom. When the mushroom is all grown, it develops spores in the gills on the underside of the cap. The spores will create new mushrooms, and so the cycle repeats. I just used this article to coroborate info presented in S1E11 StarTrek:Discovery. You answered my query perfectly.